Can our imagination cope with the inevitability of inequality? 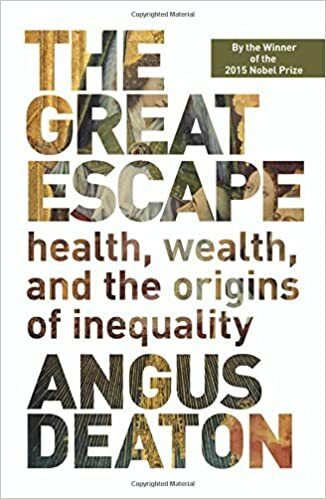 Still catching up with last year’s Nobel Prize winners, I recently read Angus Deaton’s book The Great Escape: Health, Wealth and the Origins of Inequality. It is marvelously clearly written, and covers the history of improving health and economic growth in a distinctive way. Escapes leave people behind, and luck favors some and not others; it makes opportunities, but not everyone is equally equipped or determined to seize them. So the tale of progress is also the tale of inequality. … Not everyone gets rich at the same time, and not everyone gets immediate access to the latest life-saving measures, whether access to clean water, to vaccines, or to new drugs for preventing heart disease. Even if progress continues in the future, which Deaton is cautiously optimistic it will, this will inevitably produce new inequalities (even if old ones are also reduced). The last time all human beings were more or less at the same level of technology and social organization was the Paleolithic Era. …By 2100 or 2200, most people on earth may be urbanites equipped with modern technology, not peasant farmers. But even in an industrialized world of wage workers and cities, the gaps between rich and poor regions are likely to remain enormous. Even as some backward areas catch up, innovative regions will shoot ahead. The essay argues that futures that are imagined as uniform have often proved a completely unreliable guide to the actual course of events. In reality, progress produces differences among countries, which in turn create great-power rivalries, wars, and migration–all unavoidable features of our contemporary world. Thinking about progress as uniform is not just incomplete, but fundamentally misleading. But Lind of course is really talking about politics not just the literary genre of science fiction. The example he closes with is the world government so often imagined in science fiction, with its real-life echoes in idealistic international schemes like the United Nations and the European Union. World government has of course become steadily less likely not more likely over time, and the assumption that the natural course of progress is for more homogeneity and more integration has also been sorely tested of late. Both Lind’s essay and Deaton’s book (particularly the first half) are very much worth reading and pondering.